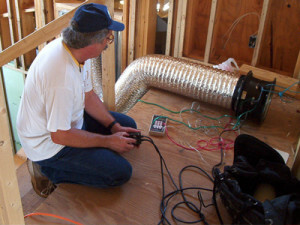 Inspection and testing is a valuable way to improve a building’s energy efficiency. At Green River, we inspect and test to locate leaks! We routinely use several tools to help us find leaks – the blower door, the duct blaster and the thermal imaging camera. Once located, leaks can be stopped through proper sealing with caulk, foam, or other methods. Energy efficient buildings are air tight. The average building loses 30% of its air to leaks in the building shell around improperly sealed windows, doors, electrical penetrations, duct connections, and plumbing vents. Air leaks in existing buildings can cause indoor air quality issues by allowing moldy, moisture laden air from the exterior to be drawn into the living space. This can lead to mold growth inside the building and oftentimes, occupants will experience allergic or asthmatic symptoms as a result. Energy efficient buildings also have tight ductwork. The average building loses 30% of the conditioned air that passes through the duct system before it reaches the point of delivery. Duct leaks in existing buildings can cause indoor air quality issues by allowing moldy, dust laden air from the crawlspace or attic to be drawn into the HVAC system and delivered to the living space. This can be particularly troublesome for individuals with allergies or asthma. The blower door is a powerful fan mounted into the frame of an exterior door. 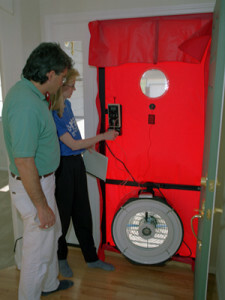 The blower door test measures the air leakage of a building by slightly depressurizing it to -50 Pascals. This is accomplished by using the fan to pull air out of the building, simulating a 20 mph wind on all sides of the building. The leakage rate from air pulled into the building through cracks and gaps is then measured by the fan speed required to maintain that pressure. Most energy labeling programs and many local building codes require blower door testing, but anyone can have a test done to establish the energy characteristics of their building. Blower door test results can be used to determine the efficiency of a newly constructed building prior to sheetrock installation, and additional air sealing can be performed, if needed, before it is sealed up. Alternately, a blower door can be used to actively direct air sealing in an existing dwelling, allowing the operator to locate and block leaks at accessible gaps and cracks in the building shell. Tests that are conducted before and after air sealing allow an actual measurement of its effectiveness. 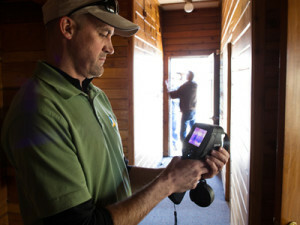 A thermal imaging camera (infrared camera) measures surface temperatures of walls, floors, ceilings and other objects. It helps to detect areas of heat loss or heat gain in a building by making hot and cold spots visible. The camera detects infrared radiation in a way similar to how an ordinary camera detects visible light. Generally, the higher an object’s temperature, the more infrared radiation is emitted. The camera takes pictures that show an object’s temperature measurements, with the brightest (warmest) parts of the image customarily colored white, intermediate temperatures being reds and yellows, and the dimmest (coolest) parts being blue or black. Along with the image, the picture also shows a scale next to a false color image, which relates temperatures to colors. Thermal cameras can record the temperature variations within a building and the resulting images can be very helpful in assessing where problem areas are. For example, a camera can be used to find areas of insufficient insulation, leaky windows and doors, poorly sealed ductwork, wet areas inside walls and under roofing, overheating electrical circuits, and cracks and gaps in framing that require air sealing to improve building efficiency. 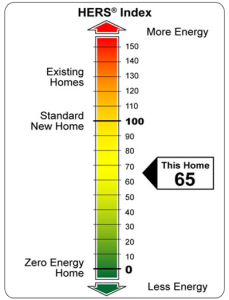 A HERS Rating is the nationally-recognized method for measuring a building’s energy efficiency. This rating must be done by a certified professional, a Certified Home Energy Rating System Rater (HERS Rater). It is required for participation in most energy labeling programs and is also sometimes required by local building codes or sponsors, but any building can be rated and there are a lot of great reasons to do so! A rating can tell you a lot about the home you live in, like how efficiently its operating and where modifications can be made to achieve greater energy savings and improve occupant comfort and health. If you are selling your home, a low HERS Index Score can result in higher resale value or alternately, if you are buying a home, you can determine the need for energy-related upgrades and pinpoint operating costs. If you are building a home, a projected rating can be established from the plans, which will give you some idea of how energy-efficient it will be, and allow you to modify the plans if needed, to adjust efficiency to the desired level prior to starting construction. 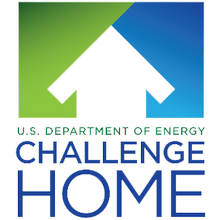 Energy labeling refers to the various voluntary green certification programs currently available for new homes. 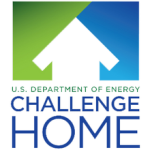 For those individuals who truly want a green, energy efficient, healthy, durable home, participating in a green building certification program is one of the best ways to guarantee the result. 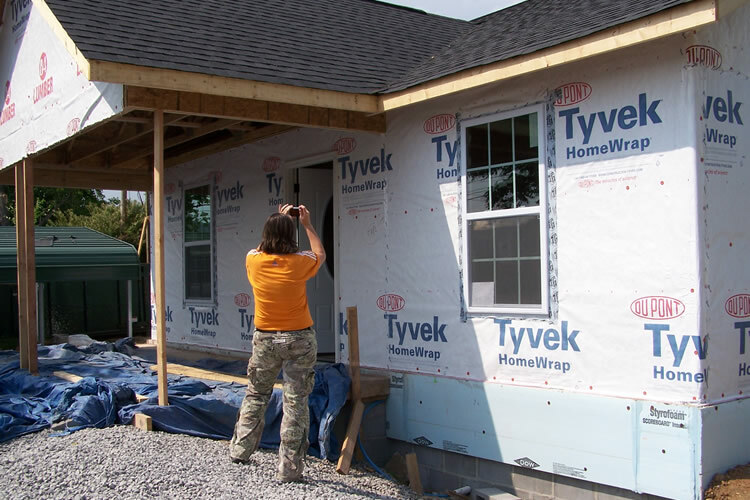 While working with an experienced green homebuilder can be extremely beneficial, it is not absolutely necessary, as long as you have a builder who is willing to work with you and within the guidelines of a green building certification program.